It was a night to celebrate the arts in Central Square Tuesday with the unveiling of the “Stories of Lynn” mural outside, and an All City Student Art Show inside Lynn Arts and offerings at the Lynn Museum and RawArts as well. Ten-year-old Jillian Miles had a big week with her first singing gig and an opportunity to sell her first piece of art. 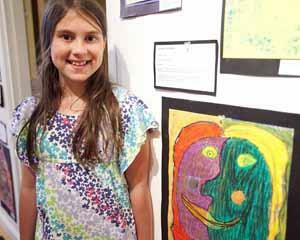 Miles’ dad Ed said his daughter sang the National Anthem over the weekend at the Lynn Youth Soccer Tournament and Tuesday had an offer to purchase her Picasso-esque painting, which debuted at Lynn Arts. “We’re very proud that she likes the arts,” said her mother, Dawn Miles. Laura Wilhelm, president & director of Collaborative Artworks Inc., which rents space from Lynn Arts, said she is always offering to purchase student art but the museum doesn’t allow it at least from this particular show. She said she loved that the pieces in the show ranged from the ancient art of basket weaving from Ingalls School students to the more pop art stylings of students at the Sisson and Tracy Elementary schools. The latter students created ceramic replicas of pop culture food items such as a pair of donuts in their parchment paper protectors sitting on a Dunkin Donuts napkin, a box of McDonald’s french fries and a taco complete with packets of salsa. State Rep. Steven Walsh couldn’t have agreed with Wilhelm more. Speaking to a crowd of city and state officials, art teachers and art lovers during the unveiling of the mural, Walsh said art is the most important thing when it comes to the quality of life in any community and it’s been a struggle for Lynn, until now. Walsh, who has championed arts and culture on the state level, applauded Mayor Judith Flanagan Kennedy, the School Administration, and the Economic Development and Industrial Corporation for supporting arts in the downtown area and in the schools. Kennedy said she overheard someone give what she thought was a perfect description of the downtown renaissance. “We have momentum, you can almost feel it, it’s almost tangible … now let’s keep it going,” she said. The mural is the result of more than two years worth of work but it’s still not complete. Walsh said a fundraising effort will soon begin to finish the top portion of the piece. Created by local artists David Fichter, Yetti Frenkel and Joshua Winer, the piece also includes mosaics created in collaboration with students in three middle schools and three high schools. “It is the history of being an immigrant, urban and artistic community,” Walsh said. Inside Lynn Arts, student pieces include Mesoamerican clay whistles/animal figures from Lynn Classical art teacher Patty Klibansky’s classes, character masks from Marshall Middle School eighth graders, a wall of water color paintings and dozens of three-dimensional pieces. State Rep. Donald Wong stood looking for a long time at a group of photographs and self-portraits done by Klibansky’s 10th grade students. Xiomara Gutierrez was beside herself with excitement as her daughter, Katherine Zuniga, pointed out the Cherokee-inspired woven basket she created. Zuniga said she already had a love for the arts. Around the corner The Lynn Museum featured the music of Tony Gallo and the artistic renderings of shoes done by the Public School students of art teacher Monica Mitchell.